Creating wedding invitations doesn’t mean you need to be an apprentice professional writer, or have a business doing graphic design. Use your own PC and a little creative thinking. You can make your own wedding invitations that will let everyone you love know about your special ceremony. Consider doing homemade wedding invitations. * Do it yourself (DIY) kits are home-made invitation creating kits made easy. Kits have unprinted pre-cut invitation templates. You might print the invitations on your home printer, or, to save the time, take your templates to the local copy writing shop. * While you look around for kits, be careful to understand the contents of the homemade wedding invitations kits you’re purchasing. For example, many kits only have invitations with envelopes, which means you have to buy the enclosure cards separately. On the other hand–certain kits have the invites, envelopes and enclosure cards and envelopes. *Certain online sites are providing easy DIY homemade wedding invitations, by posting templates for downloading on their websites. Templates are available to fit any size and style you wish and normally come with most word processing programs also. Order paper samples before you print your invites. You can sample the quality of the paper, and also may be able to run a copy (or two) through your printer to see what the homemade wedding invitations will look like. While printing, putting together, and addressing all of your invites can be a tough task for the most enthusiastic of soon-to-be brides…get friends and family to help make your homemade wedding invitations. Also don’t forget your bridesmaids…they have been, or will be in your shoes someday. You may need to draw them in by providing snacks or drinks. If you plan to go the home-made way to save on printing fees, be sure you set a proper budget for a DIY job. You can easily get yourself caught up in making a beautiful invitation that will be just as expensive as a print shop job. That “simple” invitation you had originally planned, can fast turn into an expensive budget killer. Set a spending budget before you start putting your homemade wedding invitations together…your wallet will thank you. 4. Shop online for great deals. In the past, brides had to order invitations through local printing shops or middlemen–such as flower shops or boutiques. Even though this process provided convenient shops for your wedding day needs, it also created more expense. Like so many benefits that come from the internet, you can now find helpful people online to make things cheaper in the tough economic times we’re having. 5. Make sure you have fun. 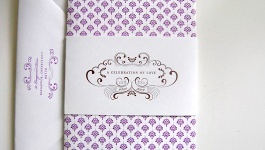 Smaller budgets can force you to rely on using homemade wedding invitations to cut costs. Make sure you attack the project with full gusto. You never know, you may find a creative side you never knew existed. Have fun, and get them done.